Nintendo will take a loss on every Wii U sold at launch. 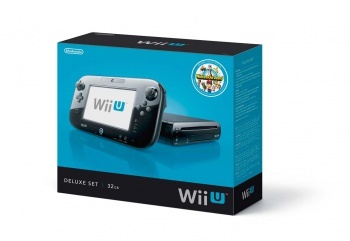 Were you hoping to get a Wii U on launch day? If you haven't reserved one yet, you might be out of luck. Nintendo President Satoru Iwata has stated that pre-orders for the console have completely exceeded Nintendo's expectations, stating on the publisher's recent financial results presentation that "it is has now become more likely that it is our production capacity, rather than consumer demand, that will place limits on our Wii U prospects for this calendar year." Gaming retailer GameStop exceeded its allotted Wii U pre-orders last week, and since then more than 250,000 hopeful gamers have put their names on waiting lists to receive a Wii U from post-launch shipments. The $349.99 deluxe bundle, which includes a black console, Nintendo Land, a GamePad charging cradle, and a console stand, is doing better in reserves than the $299.99 basic model. Iwata also reported that the Wii U would be sold below cost at launch, which would result in a loss for Nintendo. He said that this was due to "the yen's continuous appreciation" as well as the publisher's choice to give the Wii U a price point that would be appealing to customers, rather than base it on manufacturing costs. "In this first half of the term before the launch of the Wii U, we were not able to make a profit on software for the system we we had to book a loss on the hardware, which is currently in production and will be sold below cost price." This isn't an unusual move for publishers; 3DS systems were sold below cost after their massive price drop, and Nintendo finally stopped losing money on them earlier this year. The holiday season demand for Wii U systems could help Nintendo reach its ambitious sales goals for the end of the financial year. It's not exactly surprising that a new Nintendo console would sell well at launch, especially when that launch is right before Black Friday and the holiday shopping season rush. Whether or not the Wii U will continue to sell well into 2013 remains to be seen, but it seems safe to predict that those who didn't pre-order systems might have a hard time getting their hands on a Wii U before the new year.